Ten million new millionaires will be created between 2006-2016, and The Next Millionaires explains how you can become one of them—especially if you are in direct selling, technology, home-based business, product distribution, or an emerging trillion-dollar industry like wellness. In 1989, at the beginning of the worst period of economic decline since the Great Depression of the 1930s, most experts were predicting decades ahead of high interest rates, high inflation, and economic gloom. The most popular book in the U.S. was titled The Great Depression of 1990. In 1990, at the lowest point of this recession, I wrote a book, Unlimited Wealth: The Theory of Economic Alchemy, that predicted exactly the opposite: The 1990s would be an era of unprecedented growth and opportunity, with seemingly impossible low interest rates and low inflation. This book predicted that those who followed my new technology-based economic theory stood to become billionaires, let alone millionaires, in just the next 10 years. The book also predicted a massive sea change from traditional asset-based wealth to technological wealth, and forecast an immediate crash for Japan, then the world’s most powerful per capita economy. Unlimited Wealth was largely criticized by the media and economic community, but openly praised by many business leaders including Sam Walton, then the richest man in the world, and by Larry King, who invited me to appear three times on Larry King Live! From 1991 to 2001, the Japanese economy collapsed while the world economy enjoyed the highest growth rates ever recorded—with low inflation and even lower interest rates. In the United States, household wealth tripled—growing from $13 trillion in 1991 to more than $40 trillion in 2001. Over the same ten years, the number of U.S. millionaire households doubled, jumping from 3.6 million in 1991 to 7.2 million in 2001. Then everything changed on September 11, 2001. As the towers of the World Trade Center came crashing down before our eyes, something else came crashing down along with them. Millions of people lost faith in their economic future. Yet despite the gloom and doom of the last few years in the media, there was no real economic downturn. Everyone screamed “recession” in 3Q 2001 when GDP declined by 0.2 percent—but then GDP grew by ten times the amount of the decline in 4Q 2001. The Dow Jones fully recovered by 2004 and U.S. household wealth rose 20 percent to $48 trillion—the number of U.S. millionaires grew from 7.2 million in 2001 to 8.5 million by the end of 2004. But this is only the beginning. Similar to where we were in 1990, the U.S. and certain parts of the world economy in 2005 are about to experience the greatest economic boom in our history. From 2006-2016, U.S. household wealth will double to $100 trillion, and 10 million new U.S. households will become The Next Millionaires—bringing the total number of U.S. millionaire households to 18.5 million. This has enormous implications for individuals today wanting to join the millionaire population explosion, and for companies and professionals wanting to market to this new elite class of 18.5 million millionaire households, representing about 40 million people in the U.S. alone. If this seems impossible consider this: I am only predicting a doubling of U.S. household wealth to $100 trillion in the next decade—it tripled in the 1990s; and it takes only $10 trillion to create 10 million new millionaires from scratch. The Next Millionaires explains in detail why the 21st century will be known as the age of the entrepreneur, and how you can stake your claim to being one of these next 10 million millionaires—especially if you are in direct selling, technology, home-based business, product distribution, or an emerging trillion-dollar industry like wellness. It explains how old models of opportunity in physical distribution have given way to new opportunities in intellectual distribution, defined as teaching people about products or services that they didn’t even know exist. 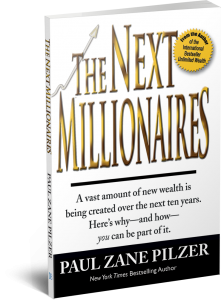 And, drawing on Pilzer’s 33 years of experience as an entrepreneur and employer, it explains how to use your past to find your place in the new economy and your ticket to becoming one of The Next Millionaires.